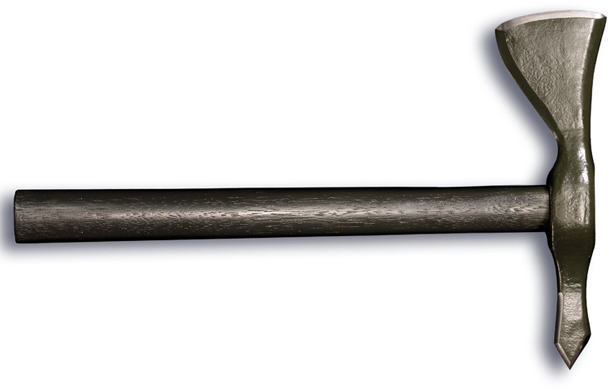 It took Peter LaGana a lifetime of armed combat and months of design and testing to perfect the Vietnam Tomahawk. Now, there's an exact replica of this historic weapon. Like the original Vietnam Tomahawk, our copy is light enough to be carried all day without causing undue fatigue. In combat, this lightness translates into speed; allowing quick changes in direction, even in mid-stroke! The blade of the "hawk" offers a wide, upswept primary edge for tremendous cutting, slashing and chopping potential. The secondary edge on the lower side of the head is specially curved and partially sharpened for both a cutting and hooking attack. When combined with the "V" shaped spike on the back of the hawk head, it is wickedly efficient. It comes complete with a leather sheath in the original oxblood color. I bought two of these from Cold Steel and carry them with me any time I go fishing, camping or backpacking. They are perfectly balanced, extremely light weight and to date have never had one not stick. Okay for small kindling in the campsite, but not for heavy wood. Buy their rifleman hawk if you need something that heavy. Excellent quality!